When we hear of large scale crises, many of us probably feel a tug to help in some way, but then begin to feel so overwhelmed by the magnitude of the problem and start to reason that our small contributions may do nothing to solve the problem on a larger level. Therefore, instead of doing any small something we end up doing nothing. Thankfully, there are many wonderful organizations that exist to help organize and pool our 'small somethings' to make useful larger impacts. When looked at in sheer numbers, the global orphan crisis is staggering. Over 140 million children are orphaned around the world. Our minds simply cannot process this magnitude. Numbers on such a large scale do not make sense to us. Thinking for a second that the entire state of California has a population of only 37 million, we can begin to grasp the enormity of this crisis. It is HUGE and to complicate matters, the orphan crisis is simply a symptom of the underlying injustices that lead to orphaned children and a host of other preventable circumstances. One early morning, after a fierce storm had hit the coast, I strolled to the beach for my morning walk. Horrified, I saw that tens of thousands of starfish has been washed up on the beach by the winds and the waves. I was saddened by the realization that all of them would die, stranded on the shore, away from the life-giving water. Despairing that there was nothing I could do, I sat down on the sand and put my head in my hands. But then I heard a sound, and I lifted my eyes. There, in the distance, I saw a man bending down and then standing up, bending down and standing up. Curious, I rose and walked toward him. I saw that he was picking up the starfish, one at a time, and throwing them back into the sea. "What are you doing?" I yelled. "Saving the starfish," he replied. "But don't you see, man, that there are tens of thousands of them?" I asked, incredulous. "Nothing you can do will make a difference." He did not answer me but instead bent down, picked up another starfish, and cast it back into the water. Then he smiled, looked me in the eye, and said, "It made a difference to that one!" As you can see, doing something, regardless of how small it seems, does matter. 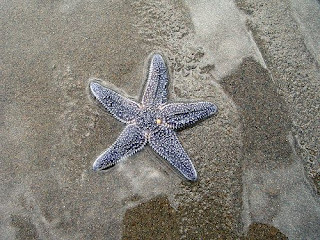 Furthermore, our actions (or inaction) will not only matter to that one starfish, but to entire generations, present and future, who have experienced that starfish's story. If everyone would get up and start throwing the starfish back into life-giving water, they all could be saved. I know that sounds idealistic, but it is true from a sheer statistical perspective. We have enough food and water to provide everyone on this planet enough sustenance. Once basic needs are met, we can start working on repairing human dignity and providing the tools necessary to build and sustain communities. I often wonder what our world would look like if countries were to take a mere fraction of a percent of what they use on military spending and divert those resources to build up rather than destroy, unite rather than divide. In our home, we are humbled that God has used our imperfect family to change the course of history for three starfish. Their present situation has been drastically altered as they moved from a situation with little to no hope into one with safety, security, and love. From a place where hard work may never amount to anything to a place where hard work is generally rewarded, education usually means relative security, and basic needs are met consistently. In addition, I believe their story had impacted those around us: our family, community, and others we come in contact with day in and day out. To know that other families have decided to adopt or foster because of what they have witnessed in our home, moves me to tears. That, is God at work...moving hearts, transforming lives. But remember, it takes action on all of our parts! Finally, to think about how Sporty, Big Sister, and Sissy will grow and one day have families of their own...wow, not that is where I really see God at work. Thinking about this major life change for them, that is, to be the starfish that got picked up and cared for, brought in and loved, nurtured and trained into adulthood. Thinking about how that will impact their children and their children's children and how God will continue to use the rescued to rescue. Do you feel it? Yes! That is God building his kingdom...one starfish at a time. Father God, thank you for rescuing me. I love because you first loved me! Thank you for infinite love and new mercies. Thank you for trusting and empowering us to parent five of your most precious children. Far from perfect we are, but here we stand willing. Thank you for teaching us about your love and your character.